Each of the following settings shares many of the same options for Adding, Editing, Reordering, Disabling and Deleting. Add – To add a new item to the current list, click on the blue button. 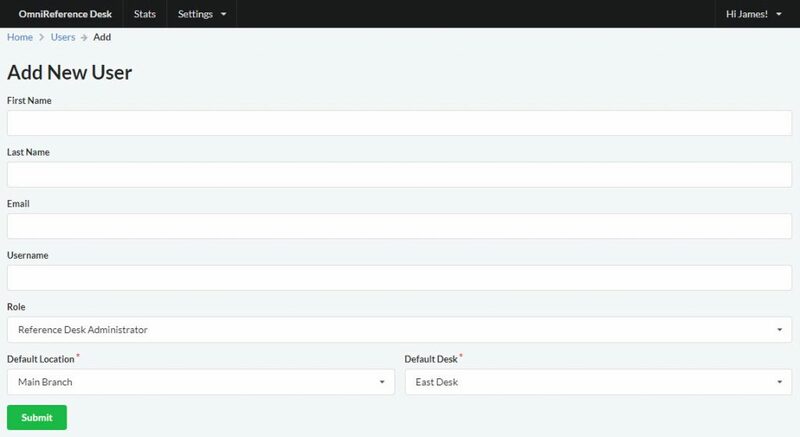 Reorder – You can reorder the items in the list by grabbing the crosshairs and dragging the table row into the desired location. Disable – You can disable any item in the list by clicking on the slider to toggle it. Delete – To delete an item, simply click on the additional options icon and then selecting “Delete”. Edit – To edit an item just click on the item’s name in the list. Additionally, each Setting has its own options which will be explained below. Each new system is preconfigured to include the following Contact Methods: Walk-In, Email, Phone, Chat and Other. On initial setup, you can rename these to whatever you like. Once you start recording data, changing the name will be reflected in the reports. To prevent altering data, you can disable methods and add new ones. To add new Contact Methods all you need is to click “Add” and give the method a name. 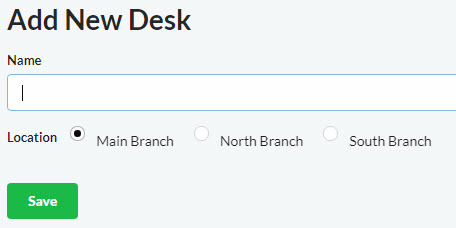 The only required options for setting up a new Desk is a name and the Location. Because Desks represent physical desks, they can only belong to one Location. Each Location represents a physical library, branch, or department. To create a new Location you just need to give it a name. Since both Desks and Forms belong to Locations they can be seen and accessed from the Location editing screen. Library Name – This is the name displayed on the left side of the top navigation bar. Timezone – You will need to configure the timezone to reflect the Main Location’s timezone. Each new User must have a unique username and email address. You can assign the level access they should be given in the system by assigning a role (Administrator, Librarian, or Staff). All users will have access to all Locations and Desks, but you can specify a default for each that will be selected when the User signs in. If you choose to track the amount of time spent on each transaction then you can set up the Times by giving each one a name or label and the actual value used to calculate the total times. Each new system is preconfigured to include the following Times: < 5 (3 minutes), 6-10 (8 minutes), 11-20 (15 minutes), 20-30 (25 minutes), 30-60 (45 minutes), and > 60 (60 minutes). You can change, disable, or delete these as you see fit, but similar to Contact Methods, changing the values after you have started collection data will affect the data output in the reports.